I have been making maps for as long as I remember. 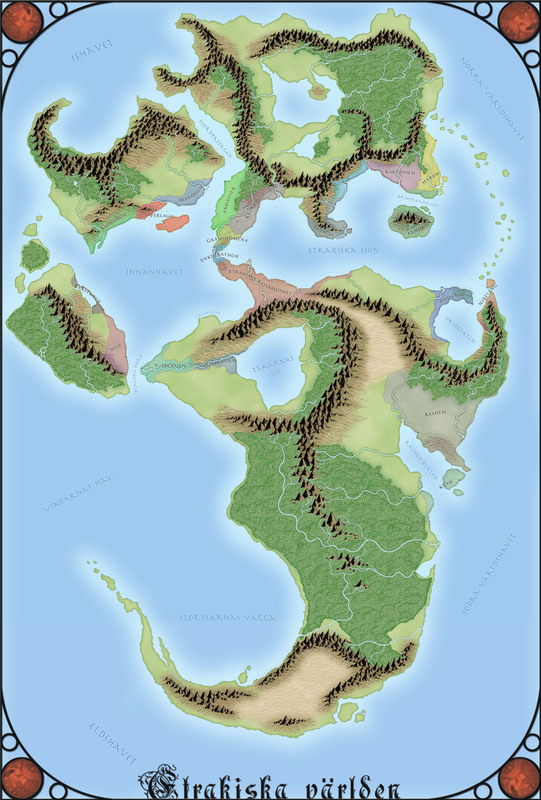 I think my interest in maps started when I discovered the maps in The Lord of the rings. I remember how I used to sneak in to my uncles room together with my cousin to look at the maps in the book. I thought they were amazing. When I got a bit older I started to play role playing games and making my own adventures and maps came naturally. Making the maps for my worlds was usually where my adventures ended so after a while I only made more maps for adventures that I bought. In those days all maps were made with pen and paper,this was long before you had any powerful computers at home. But as usually happens the people you play with grow up and start moving around for studies or work so my gaming group kind of disappeared. After that I mainly made maps for myself, sometimes sharing them with friends. But in 2008 those things were about to change. That was when I discovered the Cartographers guild on the Internet and suddenly I realized that there were a lot of people like me out there. People who sat at home making maps. The first map I completely made in a digital format was my Etrakien map, a map that also got the Cartographers choice award on the Cartographers guild site. Something I never expected but was deeply honoured by. After some time i started to get asked if I could do commissions but most of the times I turned them down due to lack of time. When having small children it is always hard to find time for other projects then family. But for some reason this spring the number of people asking for commissioned work has increased a lot. With my kids now being older and also due to some encouragement from my wife I’ve decided to go pro. So from this May I’m running a small one man company doing maps for the ones in need. My main tools of trade are Photoshop, Art rage 4, Campaign Cartographer 3 with addons and not to forget my Wacom Cintiq 13hd that I’ve now invested in. So have a look at my blog in the near future for a new page called commissions, where you will be able to find some more information about how to contact me if you like to have a map done. This entry was posted in Maps and tagged Commissions, Making maps by clercon. Bookmark the permalink. Just discovered your blog recently and added it to my feed. Congrats on the move to pro, I hope you do well! I wish you the best in your endeavor. With what you shered of your skills and talents and expect that you will end up doing quite well. Well thanks a lot, and I do hope you’re right. The reason for more guys asking for your maps is, of course, that your work is outstanding. In my opinion you have reached a professional level of craftsmanship and, on the other hand, you avoid a too clean, too streamlined, too “everyday” design. This makes your maps very interesting, I bet you will be doing well. Thanks a lot for your comment, and I’m glad you like my maps and blog. Hello Pär. I might need your skills for a city soon-ish, how can I contact you?